I love salad. I'd eat it every single day if it wouldn't result in protest from the family. Today, I had the grilled chicken salad from Cafe Rio. 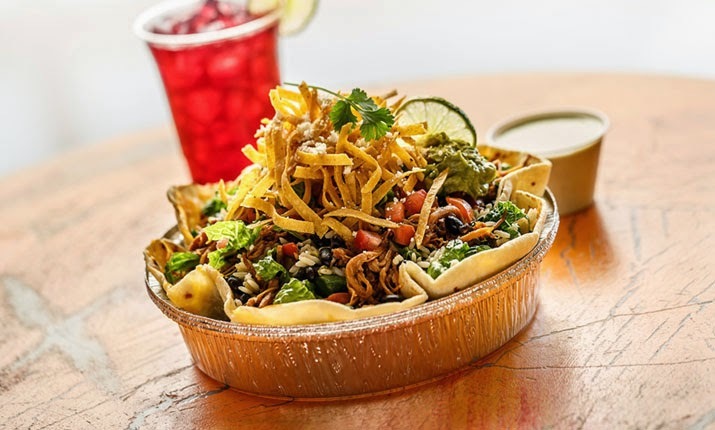 It comes in a big flour tortilla "bowl" and has black beans or pinto beans, (I hold the rice), shredded grilled chicken, pico de gallo, guacamole, cilantro, lettuce, tortilla strips and cotija cheese, with creamy tomatillo dressing (or you can choose cilantro lime vinaigrette). The sensation of flavor in my mouth is nothing short of symphonic. My only complaint is that the ingredients are layered, meaning the beans are on the bottom, then the chicken, then pico, then huge leafs of lettuce and then a sprinkle of cheese and tortilla chips. The guacamole is dropped in two balls on either side. I always run out of lettuce before I get to the bottom, which does NOT stop me from eating the whole thing it's just that halfway through it becomes (lettuce)less salad and more of a glob of beans, pico, chicken and dressing. Overall, I don't care because it's delicious. The above product was purchased by me for my personal use. I am not being monetarily paid for this review. I will give my honest opinion and thoughts regarding said product.